Are you looking for a state-of-the-art, American-made rifle that delivers expert-level precision and an unbelievably good time? Look no further than this beauty. Daniel Defense is the preferred rifle of all of the employees at Backwater Guns. This rifle is designed for shooters who prefer the benefits of the KeyMod system, and it is integrated in the new Slim Rail. KeyMod is a recoil-resistant, two-part, direct attachment method for accessories that offers outstanding “return to zero” when accessories are removed and reinstalled. This rifle offers incredible weight savings as well as superior cooling, ergonomics, and modularity while maintaining the strength and durability consistent with Daniel Defense. The long 15-inch rail gives operators the option to have the support hand extended out closer to the muzzle allowing them to drive the gun more precisely and prevents over travel when transitioning between multiple targets. This combined with the mid-length gas system, which is known to have smoother recoil, allows for quick but precise rapid fire. 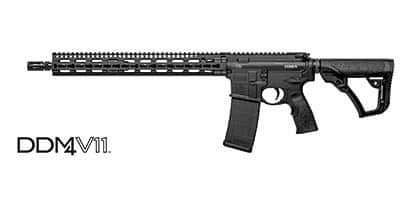 The DDM4V11 is equipped with a free-floating, Cold Hammer Forged, 16” government profile barrel and the newly designed, rugged and comfortable Daniel Defense buttstock and pistol grip.